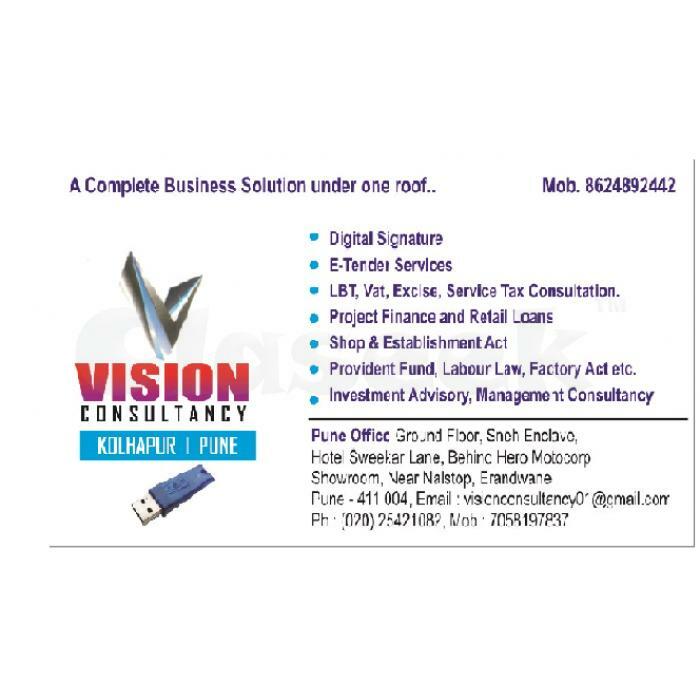 Vision Consultancy provides all types of digital signatures like Class 2, Class 3, Encryption, DGFT etc required for Income Tax, ROC, E-tenders, DGFT etc. We provide services in entire Maharashtra and Karanataka in cities like Kolhapur, Pune, Sangli, Satara, Ratnagiri, Sindhudurg, Mumbai, Solapur, Belguam etc. · Local Body Tax Consultation (LBT Consultation). · Digital Signatures of Ncode, E-mudhra, Class 2, Class 3, DGFT etc. · Vat, Excise, Service Tax Consultation. · Appeals Income Tax Consultation. · Stock Audit, E-tender filing, Staff Training, System Development, etc. · Breakage Audit, ROC Consultation, for Income Tax, ROC, E-tenders, ZP, etc to CA, CS, CWA, Tax Consultants, Advocates, Contractors, Companies and vendors. We provide services in Maharashtra, Karnataka, Kerala and other many states in India in cities like Pune, Kolhapur, Sangli, Satara, Mumbai, Ratnagiri, Sindhudurg, Nashik, Aurangabad, Belgaum, Hubli, Bangalore, etc Vision Consultancy has emerged as one of the leading & trusted name in providing Digital Signature Certificates.